Hi I’m Harry, a 24 year old living in London. I’m married to the lovely Perdie and have a two year old son called Reuben. I’m originally from Gloucester however last year I joined The Diana Award Anti-Bullying team and now take up the role of Aftercare and Accreditation Coordinator. I have a passion for helping young people realise and reach their potential and bullying is a massive barrier to that and that’s why I believe the work we do is so important. I have decided to take on a challenge to cycle 500 miles in 5 days. I will begin in London and go via Birmingham, Leeds and Sheffield. I will then finish my cycle in London on Stand Up To Bullying Day (13th June). Harry prepares for one of his many long training cycles ahead of his 500 miles trip. Since joining the team last year I have seen the immense impact the programme has on the lives of so many young people. This has motivated me to do something more than what my role description says I do, with the aim of impacting more young people’s lives. I’ve been slowly building up the miles on the bike, in my latest cycle I completed 30 miles in just over two hours, however I need to speed up the training a bit as the cycle is just a few weeks away! 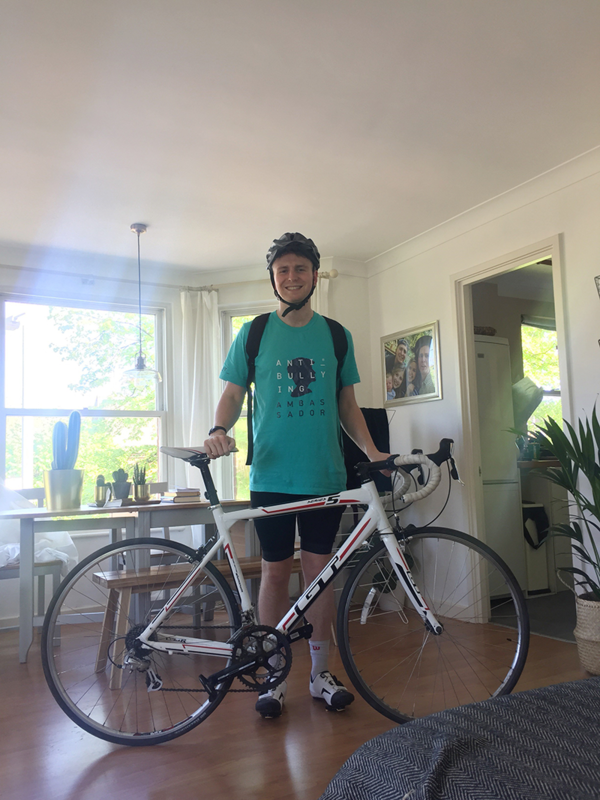 It goes without saying that I hope I manage to complete this challenge but I’m really excited to just get out into the countryside, especially cycling through the Peak District, that will definitely be a highlight! I set a target of £2000 and I’m at around £950 so far which I’m really pleased with, the closer to £2000 I can get the better! I hope that the money I raise will help train up more Anti-Bullying Ambassadors who will then go out and make a positive difference in their schools. This means less young people experiencing bullying and more young people creating brighter futures for themselves and others.